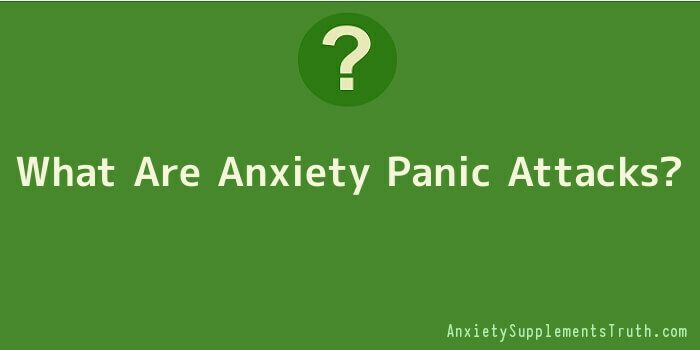 What Are Anxiety Panic Attacks? Anxiety panic attacks indicate that a person is undergoing a high level of constant stress, tension or worrying. It is important to diagnose the real causes behind this debilitating disorder and learn how to take control of the situation in the beginning; otherwise it can get worse and can lead to constant state of fear, anxiety and even depression. Anxiety panic attacks are basically sudden surges of a huge amount of emotional stress, which comes without any obvious reasons or real warnings. And they are worse than normal anxiety. It has been estimated that a great percentage of people face these attacks, at least once in their life. People who do not find proper treatment can become a victim of these attacks. And people who face them can become grave victims of their very own conditions. In some cases extreme anxiety might cause the person who suffers from anxiety to avoid meeting new people and can avoid different places. For example, a person who faces an attack in an elevator and has anxiety disorder will fear using an elevator ever again. This will put restrictions on that person at their workplace, in shopping malls and even at home. So, we can assume that a normal routine can get disturbed easily, with the unknown fears and feelings. These attacks are not dangerous, but they can be terrifying or scaring to the person who is experiencing them, because during these attacks people feel like they are out of control and feel like they are crazy. In some cases, when someone has gone through a panic attack they might think that they are having a heart attack or they might even think they are dying. These attacks can be due to panic disorder and if it is not treated on time can lead to depression, medical complications, various phobias, substance abuse and even suicide. Luckily, panic disorder is a treatable condition and by educating yourself on the symptoms and treatments available you will be on your way to getting better.